I am great at organizing intangible things that need to happen. I am TERRIBLE with organizing my material items. I want to be organized with my stuff, but it is a struggle. This morning's struggle included looking for 3 missing sneakers - my big boy's sneakers and one of the baby's. Me, my husband, my parents were ripping out closets, going from floor to floor, looking in the cars. I thought I was going to lose it since the baby has been known to throw things out, but then my mom finally found the baby's sneaker behind the dining room curtain. Finally located the big boys in a cubby by his books - I am sure the baby put it there in his effort to clean up. My son came home today with an invitation to a classmate's birthday party. Get It Done Tip: As soon as I receive the invites I look at the calendar to see if we can make it. If so, I RSVP same day so I don't have to worry about it and am being considerate of the host who needs to have a proper headcount to organize the party appropriately. I then mark my calendar and send an invite to my husband, noting who will be in charge of taking him to the party. All invites then go on a magnet clip on the side of the fridge. They are organized by order of event with the next upcoming event on top. I had my mom heat up Rachael Ray's Chicken Divan. I like to do a casserole one day a week, but it's been hard given the Paleo-kick husband. This was a good alternative, just serve a salad on the side. Bring chicken stock to boil in a wide, deep skillet with lid. Add chicken breasts and return stock to boil. Reduce heat to medium low; cover and poach chicken for 8 minutes. In a skillet, saute shallots in oil and butter for 2 minutes. Sprinkle in 3 tablespoons flour and cook 1 minute. Whisk in 1 cup of wine and reduce by half, about a minute. Ladle in chicken stock, whisking sauce as you do. Stir in 1/2 cup heavy cream. Bring to a bubble and reduce heat to low. Slice chicken into 1/2 inch strips and add to the pan, coating them in sauce. To assemble, simmer broccoli spears in 1 inch of water, covered for 5 minutes. Drain and transfer to a shallow baking or casserole dish. 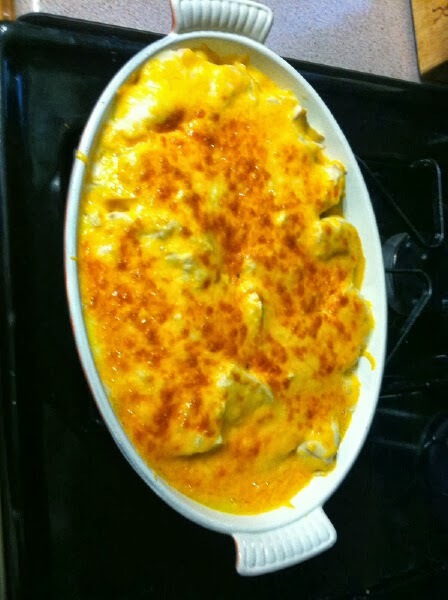 Layer on half of the grated cheese and the base chicken recipe. Top with remaining cheese and brown until bubbling and golden under preheated broiler, about 2 minutes.